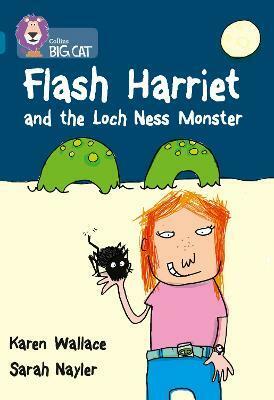 Flash Harriet , the famous girl detective, is on the trail of a crime... and it has led her to the shores of Loch Ness. Find out what happens in this comic detective story. * Topaz/ Band 13 books offer longer and more demanding reads for children to investigate and evaluate. * Text type - A humorous story. * There are chapters, which give the book an adult feel. * There is a reader response page, which gives important clues to the 'Mystery at Swag Hall'. These help young readers review the plot and know the importance of clues in their own adventure writing. * Curriculum links - Citizenship: Respect for property; DT: Moving monsters. Karen Wallace writes books for children from five to fifteen years old. She also writes scripts for children's television and natural history programmes. She has written many natural history books for children, like THINK OF AN EEL, which won awards on both sides of the Atlantic, IMAGINE YOU ARE A TIGER, and I AM A TYRANNOSAURUS REX. Her first novel RASPBERRIES ON THE YANGTZE, was shortlisted for the Guardian Fiction Prize.